Star Trek, created by Gene Roddenberry, was in its first incarnation a stunning and often bizarre epic of interstellar travel and interracial harmony (both between humans and aliens and within humanity itself). 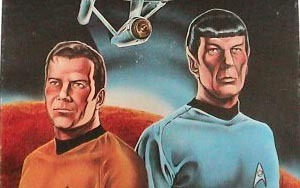 Airing in the late 1960s during the height of the Cold War, Star Trek used the allegory of outer space to project a message of harmony and understanding. Star Trek made television history when Captain Kirk and Lieutenant Uhura were shown to kiss each other other (albeit under the control of a telepathic tyrant), the first interracial kiss on US television. In its later incarnations, namely Star Trek: The Next Generation and Star Trek: Deep Space Nine, the show moved away from the traditional heavy-handed and occasionally preachy metaphoric clashes of ideologies, and delved deeper into the biases and inequalities of mankind, while maintaining a rich allegory of modern national and cultural tension. Enterprise 2001-2005 Seen as: Enterprise, ST:E, or ENT. This page was last modified on 2 March 2010, at 16:14.